More than two years ago, the Senate recognized that opioid and heroin use is a statewide and national epidemic impacting residents of every age, race, gender and socioeconomic background, and began to study this issue through the Center for Rural Pennsylvania. Legislation currently under consideration in the House and Senate is a direct result of the work done by the Center. Last week, the Senate also unanimously approved three measures aimed to address the state’s growing opioid addiction crisis, adding to bills already approved by the Senate and sent to the House of Representatives. Senate Bill 1367 would limit the amount of opioids that may be prescribed for minors. The bill includes exceptions for cases involving chronic pain, cancer treatment or for palliative care or hospice care. Senate Bill 1368 would implement Safe Opioid Prescribing Curriculum in all of Pennsylvania’s medical schools. Senate Bill 1212 would establish the School Aged Children Opioid Awareness Education Program. The Senate Republic Caucus is holding a series of Telephone Town Halls in an effort to raise awareness and gain additional insights into how to best fight this epidemic. The next one will be held at 6:30 p.m. October 17, 2016. Visit http://www.acommonwealthcrisis.com/ for more information and to sign up. Locally, the Centre County HOPE Initiative will be having their third town hall meeting at 7 p.m. October 11, 2016, to take a closer look at the opioid crisis in Centre County. Visit their Facebook page for more details: https://www.facebook.com/CentreCountyHOPE/. The Pennsylvania Senate passed Senate Bill 1341, which I support, to help eliminate wasteful government spending in Pennsylvania. SB 1341, also known as Performance Based Budgeting, seeks to streamline and justify discretionary and state government spending by requiring departments and agencies to justify their budget requests for all existing, as well as proposed programs, for each fiscal year. 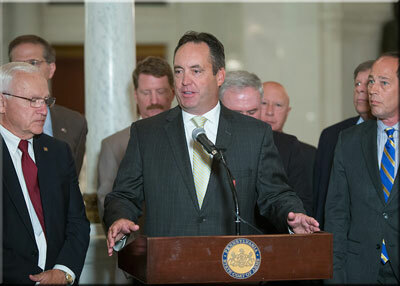 This would allow the legislature and the Governor to properly budget for Pennsylvania state agencies. A $3 million state grant has been awarded Primary Health Network to build a federally Qualified Health Center in Derry Township, Mifflin County, to better serve the health needs of area residents. The grant is funded through the state Redevelopment Assistance Capital Program (RACP), which provides funds for community and economic development projects throughout the state. It is expected to create 75 jobs. The health center will coordinate services with specialists, organizations and social service agencies to health care consumers, and house regional offices. This funding is crucial to jobs, economic development and improved health care services. I’m pleased that as a result of this grant, we will be better positioned to meet the needs of patients here in Lewistown and surrounding areas. 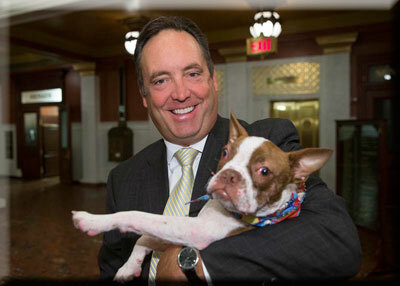 During a rally at the State Capitol Building I had an opportunity to meet Libre, a 4-month-old Boston terrier who was rescued in July from a Lancaster County farm after suffering from weeks of severe neglect. The rally was in support of Libre’s Law, legislation to help prevent animal cruelty in Pennsylvania. Senate Bill 1372, would change the existing statute pertaining to animal cruelty to bring Pennsylvania in line with the majority of other states in the country by increasing penalties for certain crimes against animals. It also adds a new classification for offenders who cause the death or serious bodily injury of an animal. Violators could be found guilty of a third-degree felony. The Senate gave final approval on Monday to a bill I’m co-sponsoring that recognizes and honors Pennsylvania’s military personnel and sent the measure to the Governor for enactment into law. Senate Bill 1155 establishes a special vehicle license plate for members of the United States Armed Forces adding special recognition for current members of the military, reserves, and Pennsylvania National Guard. This would be in addition to the currently available license plates with special recognition for World War II veterans, Purple Heart recipients and Operation Iraqi Freedom veterans. 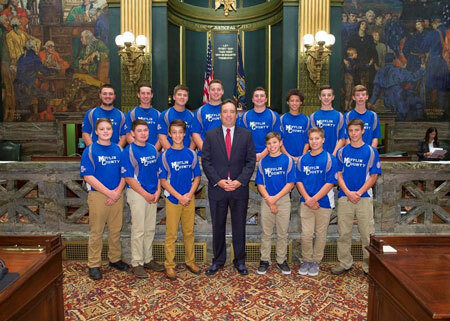 Babe Ruth Baseball 13-year-old World Series champions Mifflin County joined me at the State Capitol where they were honored for their victory this summer. Congratulations to this great group of players, their coaches and families for this outstanding achievement.